These lovely origami napkins are quick and easy to make–perfect for high tea or special occasions! Origami rose napkins are perfect for weddings in particular; silk napkins in red or white would be a particularly beautiful choice for the occasion. Once you know how to make some origami napkin folds, you can use this technique as a great ice-breaker at dinners–you can show people how to fold them, especially if there are children who need a bit of entertainment. This napkin fold is quite forgiving, as roses are not meant to look perfect. All of your rose napkins will be unique. A cloth napkin would be best suited for this origami napkin fold, however, some high-quality paper napkins may work just fine. Start off with your napkin folded into a triangle. It doesn't have to be perfectly even–it's better to fold the top layer a little bit lower than the bottom layer of the triangle, as it will eventually even out when you roll it. Now fold the triangle up from the bottom edge.​ You can decide on the 'height' of the rose at this point. Taller roses will require thinner folds here, while shorter roses will have much wider folds. Tip: Ironing your napkins before folding them is advised. This will give your folded napkins a nice crisp, professional look and feel. Keep folding up until the unfolded napkin portion is about twice the height of your roll left at the top. Flip the napkin over from top to bottom. Now start rolling from either the left or right side. Keep in mind the top edge of your rose is formed with the top edge of the napkin here. Carefully keep rolling until you reach the other end. Next, take the loose end and tuck it underneath the outer layer. You can use a butter knife to poke it underneath if you need to. Now concentrate on the underside of the rose. There are two layers of napkin here. Pull the two layers apart. Be careful not to pull the whole rose apart. 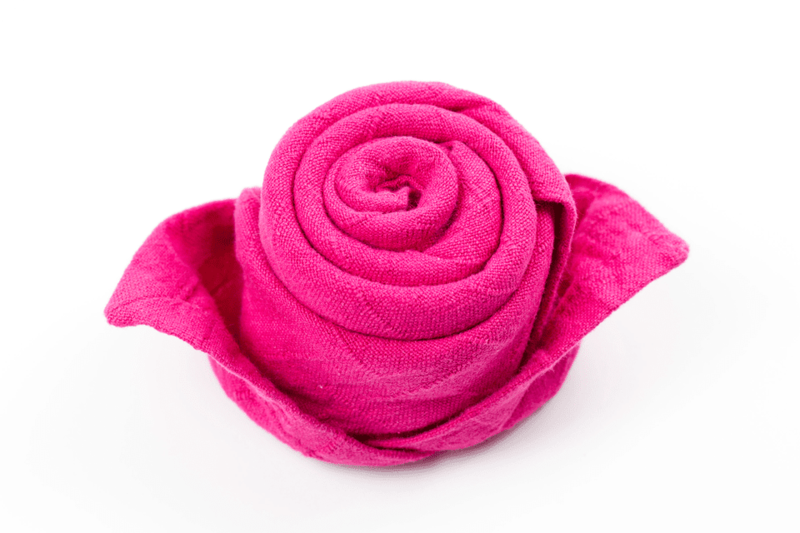 Pull the outer layer and reverse it around the rose, a bit like when you reverse an inside-out sock! The leftover 'leaf' can be twisted and then pulled up around the rose in the same way as the other one. Alternatively, you can pull the second 'leaf' in the same direction as the first without twisting, giving it a double leaf on one side of the rose. This may be a better option for floppier or thinner types of fabric. As with all origami in general, practice makes perfect, the first couple of times you make your origami napkin rose, it may not look that good, simply unravel back to start and give it another go. You can experiment with the tightness of the folding. Sometimes a looser wrap works better.